includes ashtray and lighter Smoker's Package Includes ashtray and lighter. includes (B42) rear reversible cargo mat, (AP9) rear cargo net and (RYJ) rear retractable cargo shade Cargo Convenience Package Includes rear reversible cargo mat, rear cargo net and rear retractable cargo shade. includes (DS3) body-color outside power-adjustable heated mirrors with turn signal indicators, chrome door handles, (V55) chrome luggage rack side rails, perforated leather-appointed seating and (DCP) OnStar with Directions & Connections (Must select (282) Light Gray or (482) Ebony interior trim. Not available with (12U) Dark Crimson Metallic or (92U) Silver Green Metallic.) 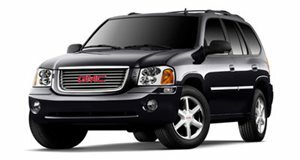 Luxury Package Includes body-color outside power-adjustable heated mirrors with turn signal indicators, chrome door handles, chrome luggage rack side rails, perforated leather-appointed seating and OnStar with Directions & Connections. includes (CF5) power sunroof and (UC6) AM/FM stereo with 6-disc CD changer. OPTION PACKAGE SAVINGS WHEN ORDERED ((UC6) AM/FM stereo with 6-disc CD changer may be substituted with (UM8) AM/FM stereo with CD player and touch-screen navigation) Sun and 6-disc CD Package Includes power sunroof and AM/FM stereo with 6-disc CD changer. OPTION PACKAGE SAVINGS WHEN ORDERED. includes (CF5) power sunroof and (UC6) AM/FM stereo with 6-disc CD changer. OPTION PACKAGE SAVINGS WHEN ORDERED ((UC6) AM/FM stereo with 6-disc CD changer may be substituted with (UM8) AM/FM stereo with CD player and touch-screen navigation) Sun and 6-disc CD Package Includes power sunroof and AM/FM stereo with 6-disc CD changer. OPTION PACKAGE SAVINGS WHEN ORDERED. AM/FM stereo with 6-disc CD changer may be substituted with AM/FM stereo with CD player and touch-screen navigation. includes (CF5) power sunroof and (UQA) Bose premium speaker system. OPTION PACKAGE SAVINGS WHEN ORDERED Sun and Sound Package Includes power sunroof and Bose premium speaker system. OPTION PACKAGE SAVINGS WHEN ORDERED.